As you can see on the image, this indicator calculates trends on all time frames using 9 indicators: ADX, RSI, MOM, CCI, OsMA, MACD, SAR, WPR, MA. 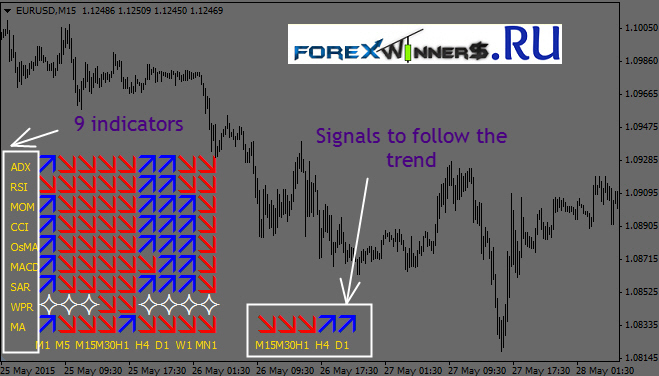 There is a general trend (M15, M30, H1, H4 and D1 time frame), which is calculated by a combination of the previous 9 indicators. ENTRY POINT: When all 9 indicators point in the same direction for the given timeframe place the respective BUY / SELL trade. EXIT POINT: When all 9 indicators point in the opposite direction for the same timeframe, exit the trade. ENTRY POINT: When 7 out of the 9 indicators point in the same direction for the given timeframe place the respective BUY / SELL trade. EXIT POINT: When all 7 out of the 9 indicators point in the opposite direction for the same timeframe, exit the trade. TIMEFRAME: This can be used on any timeframe. STOP LOSS : We recommend 85% of the timeframe’s Average True Range (ATR) HOT TIP: Keep an eye on the cumulative indicator – it highlights where the trend is going.